SQL Backup Master is a software for developers that was built to assist you in backing up your databases to various locations. Even though the program comes equipped with various features and configurable parameters, the clean layout provided makes SQL Backup Master perfect for use by even beginners to the development world. This application gives you the ability to create a brand new database backup by selecting the SQL server or even test the SQL connection if you’d like. The ability to configure everything to suit your unique needs combined with the option to compress your files if you’d like makes the SQL Backup Master a tool that every developer – regardless of skill level – will want to have at their disposal for backups. 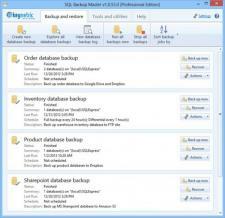 - A clean layout that’s chalked full of backup and restore capabilities. - Allows you to create a new database backup by selecting the SQL server (connect using your Windows authentication parameters or your SQL service account). - Gives you the ability to check the SQL connection quickly and easily. - Lets you upload your backup data to FTP servers, Dropbox, or to a local network folder. - Gives you the ability to connect to remote network locations (as long as you have the username and password). - A handy automated cleanup mode for removing unnecessary files. - Database compression and encryption options. - Has the ability to decompress ZIP files. - A handy backup scheduler.